Are your glass windows positioned in awkward positions? No problem! We clean windows in many different angles. Avoid the danger and loss of time. Let us handle it! 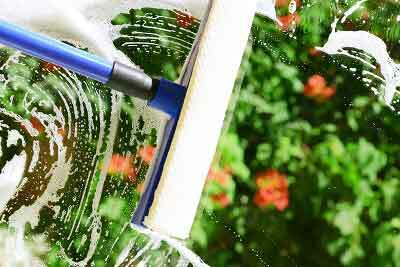 We wash both the inside and the outside of your windows, including mirrors and any other glass surfaces. Once you try us, you’ll never want choose a different company to wash your windows! Should you get a Professional Window Cleaning Contractor? Yes. The name of our business says a great deal about the quality of work we provide – perfection. We are your local and family owned window, gutter, and roof cleaning company for your home and business. Environmentally clean power-washing, window washing, gutter cleaning, moss control, bird control, mirror cleaning, ceiling fan and chandelier cleaning and Holiday lighting too! Almost every room in your house has windows. 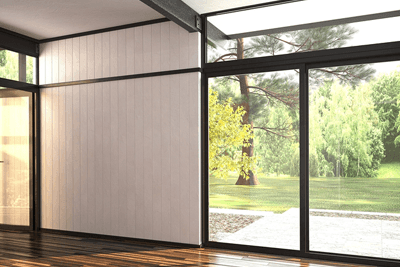 They are the connection between the inside of your home and the outdoors, while providing your home with natural light. Keeping these windows clean not only improves your view, but it is also an important part of maintaining the condition of your windows. Over time, dirt, debris, and other grime sticks to windows. There is no way to avoid this, and if you don’t have your windows cleaned on a regular basis, you may end up with irreversible damage. Debris may leave etchings if it is not cleaned on a regular basis, which will end up costing you more money when you have to replace your damaged windows. At Reflection of Perfection, we provide expert window washing/window cleaning to our customers in Issaquah and North Bend. We work on both commercial and residential windows, ensuring our clients have a clean, unobstructed view of the outside world. Our team is highly trained and has hands-on experience cleaning windows on all types of buildings, both big and small. We have all the necessary supplies to get your windows cleaned in a timely manner. Using our expert services takes the guesswork out of window cleaning, as you can count on us to get the job done right the first time. Windows are the primary source of natural light for most every room of a home or office. At Reflection of Perfection, we are in the business of offering professional window washing/window cleaning services. Everyone, whether they are a homeowner or a business owner, can benefit from having crystal clear windows. When windows are freshly cleaned, more light is able to fill the space. This means less need for indoor lighting. Also having clean windows can make your establishment look more professional. If you are a business owner, your customers will take note of the cleanliness of your building, and that starts with clean windows. Everyone has windows in their home or office, meaning everyone can benefit from professional window washing services. Many windows are hard to reach, which makes it difficult to clean them on your own. Our crew has everything we need to reach even the highest windows. If you have angled or oddly shaped windows, we can clean them with ease. You won’t have to lift a finger to have your windows cleaned. We are able to do it in less time, and you won’t have to worry about the hassle or danger of cleaning them yourself. Many people try to clean their own windows through different DIY methods. While you may have good intentions, the results are often not what you desired. It takes a lot of skill to properly clean windows. First, not all windows are located in easy-to-reach locations. This makes it difficult to clean every inch and can also become a safety hazard. When you hire our crew at Reflection of Perfection, safety is our highest priority and we take the necessary precautions to make sure your windows get cleaned and we do it safely. We bring all the right tools, including ladders, scaffolds, and even extension poles, that the DIY window cleaner does not have, and use the correct methods to make sure your windows are properly cleaned and cared for. It’s our mission to effectively clean your windows, while staying safe at the same time. 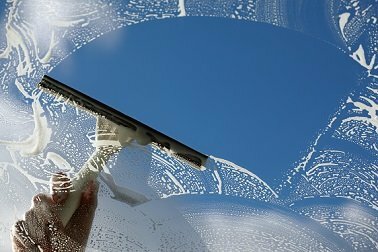 Cleaning your own windows is difficult and attempting to clean them yourself may leave them with smudges and missed spots. It’s also common to accidentally damage your windows. 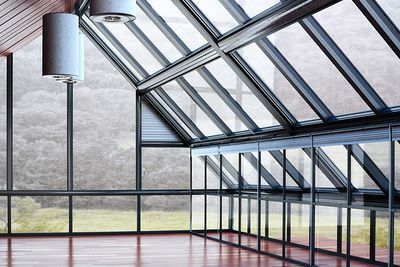 As a professional company, we use the correct techniques to ensure your windows are not broken or damaged while they are being cleaned. We also use the correct methods to make sure your windows are completely streak-free. Our cleaning treatments are designed to not only remove dirt and grime, but they also work to prevent buildup in the future. You can also trust us to properly discard our cleaning chemicals. We guarantee that our window washing services will leave you with crystal clear windows. Why choose us for window cleaning/window washing? When it comes to window cleaning/window washing, we are passionate about what we do here at Reflection of Perfection. Every project we take is completed to our high standards. As our name implies, we strive for perfection whenever we are on a job. Our window washing/window cleaning service is clearly the best in town. We clean both residential and commercial windows, and there is no job we can’t handle. It doesn’t matter if you are in a one-story building or a multi-story complex, our crew is ready to make your windows look brand new again. Our customers appreciate our honesty and integrity. We have fair pricing, and you will never find hidden charges on your bill. Our customers return to us time and time again, and refer us to their neighbors because we make their windows look the best in the neighborhood. We pay attention to the small details, including cleaning both the exterior and interior surface of every window. Let us show you why we’ve received so many 5-star reviews from our clients. You can contact us Monday-Friday from 7am-6pm or call at (425) 922-3939 to discuss your window washing needs with our friendly, highly experienced staff. It’s our goal to provide you with a clear view to the outside world. Q: When is the best time to get my windows cleaned? A: Any time is great but we recommend spring and fall. Q: How do professionals clean windows? A: We use specialized and tested window cleaning tools like squeegees, razor blades, steel wool, specialty poles that reach upwards of 60 feet, ladders and deionized pure water. Q: How do you clean my hard to reach windows? A: How we clean your hard to reach windows depends on many factors, such as the location and angle of the window. We have ladders that reach up to 40 ft. and we have very long poles with brushes on the ends. We also have safety equipment that allow us to repel off of very steep roofs.